The Cham issue for the first time is rumored in Brussels. The road that led to the fact of being recognized as problematic to be solved between Albania and Greece and the voices of a community that experienced genocide 71 years ago. The old, young Chams and those who will come from this generation of this community will remember always the name of Johannes Hahn. The politician who holds the post of EU Enlargement Commissioner who agitated the official Athens with an issue that the Greeks does not want even to hear it, imagine to accept it. The genocide against the Cham population, raised by Albania and its solution as a matter between the two neighboring countries, is the signal that for the first time in Europe's Brussels was recognized as problematic. Greek MEP Maria Spyraki asked for Hahn's opinion of some protests or PDIU activities supporting Cham's cause, but by commissioner she received the answer she never wanted to hear. He stressed the fact that the issue of seabed and Cham is to be discussed between the parties and the EU supports the dialogue. "Diplomatic relations between the two countries have been intensified, as well as political dialogue has been shaped better. The Commission welcomed the fact that both countries are discussing the establishment of a joint mechanism to be convened periodically for the resolution of the outstanding bilateral issues. "This includes determining the continental shelf and the Albanian-Greek naval zones, the rights of persons belonging to minorities and the Cham issue. The Commission has commended these efforts, expressing gratitude for the renewal of such important bilateral diplomatic engagement," Hahn said. His stance looked like a bomb in Athens, which, with all its strength, responded to the flame, just because the name Chameria was mentioned. If Greece is more restrained relating to the continental shelter, when it comes to the Cham issue, there is a different approach, as if one day the files will be opened, the mass killings, the burns of dozens of villages and the violent displacement of thousands of residents, there is no other term than "genocide". A state with scarce power like Albania, complexed to absurd inferiority to its neighbors, was nearly humble whenever it was discussed about the construction of Greek soldiers cemeteries, falled during World War II. Memorials were set up for them wherever requested in our country, whenever Greek minority in Albania raised their voices, official Athens did not hesitate to stretch hands up to matters that belonged to Albanian state politics. While the "Cham dossier" should have been forgotten,if possible never to be mentioned, as if that will happen, at best a note of diplomatic protest will come. The Cham issue, mentioned by the Enlargement Commissioner Hahn as issues to be resolved between the two countries, was said in Brussels, so the Greek government's attitude went to labeling the commissioner as a liar and biased. "The statement of the Commissioner Johannes Hahn is untrue and unacceptable. As is well known, the Cham issue is inexistent and as such, it has never been accepted as a negotiating subject, between the governments of Greece and Albania. Commissioner Hahn, with his false answer, shows that he does not exercise his role and duties on the basis of neutrality in order to advance the common interest of the union as envisaged in Article 17 of the Lisbon Convention. He has now been asked and is obliged on the basis of his institutional role to provide immediate, convincing explanations regarding the unacceptable and false content of his contested response. " That was the position of the Greek Foreign Ministry, immediately after Hahn statements, Athens passed from defense to open attack. An old tactic of the Greek government, while last week the spokeswoman of Foreign Affairs and Security Affairs in the EU, Maja Kocijancic, maintained a more diplomatic stance, pointing out that all issues between Albania and Greece should be solved through dialogue. "The commissioner encouraged the two countries to continue co-operation. This is also the spirit with which the Commissioner answers a number of questions from members of the European Parliament and they should be seen in this light," said Kocijancic, adding that she encourages the two countries to enhance dialogue and avoid possible misunderstandings on all important issues. If Commissioner Johannes Hahn's political career is to be seen, there is little room for doubt that it was a "lapsus" to mention the Cham issue, or "bias." The Austrian politician since November 2014 is the Commissioner for Neighborhood Policy and Enlargement Negotiations. He has previously served as the European Commissioner for Regional Policies during Barroso's second commission, replacing Benita Ferrero-Waldner as Austria's representative to the EU. 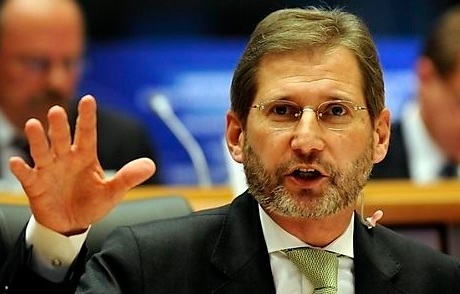 During his service as EU Regional Policy Commissioner (February 2010-November 2014), Johannes Hahn has implemented the most ambitious and comprehensive regional policy reforms of the European Union. Also, his role in the troubled Balkans several times between himself, and other times between neighboring states has been great. Maintaining an acceptable stability in relations between neighboring Balkan states has its impact. On June 6 of this year, the car with which the Greek Foreign Minister Nikolaos Kotzias was traveling was forced to enter the back door of Albanian Ministry's building. The Minister Ditmir Bushati hosted the friend at the doorstep, but faced hundreds of protesters, mostly of the Cham community protesting their rights over the genocide that they experienced in 1944-1945. Quite calmly the ministers started the meeting and then as this jod asks and at the same time "diplomacy" for them appear before the media as if nothing had happened. "We believe that a realistic treatment of the Cham issue would weaken nationalist tones and establish a kind of justice. It is not about territorial claims, since Albania has not such claims. Albania is grateful for the support that Greece has given over the years. Our approach is to respect the rights of this population. We believe that it is possible to take the example of best practices, as German-French over the respect of the victims of the world war," Bushati said. Both of them, Bushati and Kotzias occasionally showed signs of friendship and kindness to each-other, but the Cham issue at those times was more "hot" than the day of June 6 in Tirana, where the meeting was taking place. Greek Foreign Minister Nikolaos Kotzias said that the problems of the past should be left behind and to have cooperation between the two states. He said Greece would support Albania on its path to EU membership. "Regarding the Cham issue, it is known that there is a large group of Chams living in Albania, and I wish this group to benefit from EU integration. There are also some Chams that today are Greek citizens. There are also some who collaborated with the Germans who were sentenced by the Greek court on the basis of Greek and international law. They left the country and were not executed. We need to be careful when talking about them. Some want to make the same co-workers with those who deal with Nazism and want to confuse them with a group of Albanians who have not lived in Greece at all. We have a different approach and all these are familiar from the point of view of history," said Kotzias. No wonder the Greek minister's attitude to the Cham community, as even neighborly historiography has considered him as collaborators of Nazism. But just mentioning the name "Cham issue" shows a lot. The visit was named successful, without leaving a protest note by Athens during protests during the visit. However, in three years as Foreign Minister Ditmir Bushati has been between two "pressures", on the one hand of PDIU party that insisted that the Cham issue should be strongly and openly raised and on the other hand a stable diplomatic balance with Greece. However, it is the minister who raised this issue more openly than any of his predecessors, even using a clear language, not a complex and inferior one. By the end of June 1944 to March 1945, there was a large ethnic cleansing of the Cham population that killed thousands of people, including women and children and the like who were displaced violently. The gangs of the far-right Greek extremist party EDES, led by Napolon Zerva, carried out ethnic cleansing and left behind a genocide for which is little-written. 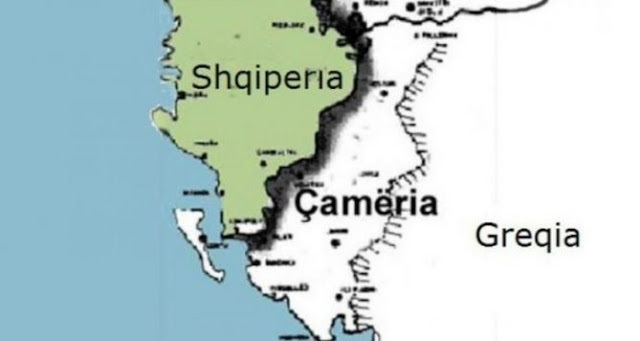 Recent studies by Albanian scholars show that over 2700 people from the Cham community were killed by Greek army bands, while 58 villages were burned and over 30,000 were forced to flee and settle in Albania.